Since 1987, Laserfiche® has used its Run Smarter® philosophy to create simple and elegant enterprise content management solutions. More than 30,000 organizations worldwide—including federal, state and local government agencies and Fortune 1000 companies—use Laserfiche software to streamline documents, records and business process management. The Crowley Group, a Boston-based executive coaching and strategic organizational consulting firm, has partnered with its clients to navigate change since 1999. Our practical approach delivers results in biotech, pharmaceuticals, and life sciences. Immersive Solutions Corporation (ISC) develops and markets common sense software solutions for a wide range of customer and markets. RDAC or Rapid Development Analytical Capability is our most popular and successful product. RDAC provides customers with the ability to integrate large diverse data sets to create a unique data analytics which are geospatially relevant to their business, without needing to invest in expensive computer systems and software. International Data Consultants (IDC) is an IT Consulting and Services Firm helping corporations, government agencies and non-profit institutions apply and use technology for successful and profitable business growth. With over 20 years of experience in IT and Business Technology Management, we are uniquely positioned to provide you with a comprehensive array of consultancy and engineering services. Hundreds of organizations have successfully leveraged IDC’s expertise in optimizing IT and business processes. NovusAGENDA is a web based solution designed to manage the entire item creation and approval process as well as meeting votes, motions and discussion. Kodak's Document Imaging business is the industry's leader of innovative document capture products, software and services. Kodak has the broadest portfolio of document capture products, software, capture-based solutions, and service and support to provide the most easy to use, accessible, scaleable, and affordable solutions for its customers to better capture, manage, archive and deliver critical business information. As the world's largest developer and producer of large format imaging solutions, Contex leads the market with innovative technology and advanced scan and copy software applications. Sold worldwide in over 90 countries, Contex solutions are recognized in a wide range of industries for reliability, value, high performance and superb image quality. 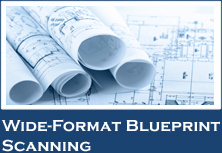 We have converted millions wide format blueprint records. Lowest rates guaranteed. 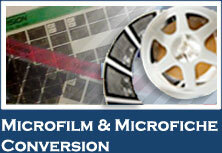 We convert millions of microfilm images to digital format annually offering low competitive rates.